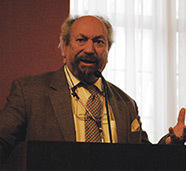 Saad Eddin Ibrahim, one of Egypt’s leading public intellectuals and human rights advocates, has paid dearly for his attempts at reforming Hosni Mubarak’s autocratic regime. The former professor of political sociology at the American University of Cairo was put on trial three times and convicted twice by an Egyptian state security court. He was sentenced to seven years of hard labor. In 2003, after serving 15 months, he was acquitted of all charges by Egypt’s highest appeals court, but he still walks with a limp from permanent nerve damage suffered in prison. He then went into exile, living and teaching abroad, most recently as a visiting professor at Drew University. But on February 11, the day Mubarak resigned, he hopped a plane to Cairo and hastened to Tahrir Square to join the celebration, his “triumphal return to Cairo,” as the Wall Street Journal called it. In March, when he spoke on a panel at Northwestern, Crosscurrents sat down with him to get his views on what had just happened in Egypt and what is likely to happen next. How would you describe what happened: a popular uprising? a revolution? a coup d’état? It was a democratic revolution in Egypt that resonated all over the Arab world. Therefore, we expect a democratic Arab world within five years. That is my prediction. You will have to keep me honest. Check with me again in five years. Is it an oversimplification to think that the will of the Egyptian people is united, or are there many layers of people who don’t support the revolution? Apparently there are. This is a society with 80 million people. There are people who benefitted from the old regime. The ones who rode in on camels? Exactly. You don’t expect a country like that to have unanimity over any issue. But the majority are proud of the accomplishment. The older generation feels a bit of sympathy towards Mubarak and feels that, as old as he is, he should not be treated badly by his people. It’s part of our tradition of respect for old age. So the guy is 83 years old and his generation can expect the rest of Egypt to be more compassionate. A trial may take place—hundreds of people have cases against him—but whatever happens, he will have clemency and he will be pardoned. Mubarak was in power for 30 years. Why did the revolution happen now and not 10 years ago? Why now? Because a generation that grew up and knew no other president but him got very educated and wanted to be part of the world. They think he is a barrier to connecting with the democratization process that took place in nearly every region of the world except ours. So that is why now. The youth bulk: 60 percent of the Egyptian population is under 30.
Who are the players that you expect to take an active role in Egypt’s future government? The Muslim Brotherhood, the January 25 movement (the young people who rallied via social networks and demonstrated in Tahrir Square), business, and the labor unions. The election would be a four-way competition. I expect the January 25th party, if they get organized, would get anywhere from 30 to 40 percent of the vote. The Muslim Brothers will get 20 percent, and the others will get smaller percentages. That will give rise to a pluralistic society. No single force will dominate. Therefore we will enter into a coalition with three or four parties. This is a good thing, at least for a transition. What does the revolution mean to you personally? Revolution means a drastic and rapid change—to remove the president and dissolve the parliament in one month is drastic and rapid change. It is something we dreamed of for a quarter of a century. But a revolution is never-ending. It takes a generation to complete all these changes. If you remember from your studies, the French Revolution took 70 years to do everything they wanted to do. What would you advise President Obama to do regarding Egypt’s transformation? Ensure that the democratic process will proceed properly and that all the new forces are fully empowered and represented in the new parliament. That is the only way to protect the revolution: use your democracy to make ours more effective. After the revolution, when the young activists came to you for guidance, what did you tell them? To continue with their demands and to get organized—they had no party, no institution. They asked me whether I would head a party they could join. My answer was, ‘I am 72 years old.’ I am advocating for the youth to lead. They should be the ones who do it and I will join them.